“Men in confusion clutched what they knew.” This is how Robert Wiebe describes the actions of America’s leaders in their “rudimentary bureaucracy” as the nation entered World War I in 1917. Much of the debacle that followed – both the wave of violent repression at home and the political failures of Woodrow Wilson, outfoxed at Versailles and in the Senate – resulted from just such limits of knowledge and practice. In essence, Progressive leaders used old solutions to solve new problems. But rather than a condemnation of human weakness, this sentence encapsulates Wiebe’s subtly empathetic historical vision: that historical actors of all stripes – radical or conservative, anonymous farmers or great men, utopians or cynics – operate within these limits, striving to preserve or reform an unfathomably complex society too “tough and plural” to conform to any one perspective. In place of a telos of progress or power, Wiebe finds “flexible interconnectedness,” in which failed efforts to control society ironically preserved a space for truly democratic pluralism. The Search for Order was published in 1967 as part of Hill and Wang’s Making of America Series. The series included six titles by different historians dividing the arc of American history from 1607 to 1960, with Wiebe’s volume covering 1877 to 1920. Although one may occasionally encounter the other titles with their distinctive 1960s cover design in a used bookstore, they are largely forgotten survey texts. Wiebe’s book persists, however, at least among professors and graduate historians, and for good reason. I would argue it is the best place to start for any student of American history, serious or casual, in getting a handle on what, for me, is the most complicated and perplexing era in American history, the so-called Progressive Era. I first encountered the book, as many graduate history students do, while preparing for oral examinations. The Search for Order is typically paired during this process with Richard Hofstadter’s seminal The Age of Reform (1955), as Wiebe usefully offers a tacit revision of Hofstadter’s brilliant, insightful, yet ultimately tendentious narrative of the period. Where Hofstadter’s goal is to contrast – with often compelling satirical verve – the failed elite moralism of historical Progressives with the technocratic successes of the New Deal coalition, Wiebe’s narrative presents a lucid, almost lapidary surface of nuanced political shifts and succinct portraiture that belies a deeper skeptical rumination on the nature of historical action. Characteristic of the best academic writing in the 1950s and ‘60s, both historians combine first-rate prose style with a willingness to make large claims, to comprehend the history of a nation and an era in one volume. Taken together, Hofstadter and Wiebe stake out many of the relevant questions about Progressivism, as one professor suggested to me, whether one agrees with the answers they provide or not. Graduate students typically pass along thumbnail sketches of such seminal texts that, while mnemonically useful in answering orals questions, often do a disservice to the finer lineaments of their analyses. Wiebe is usually shorthanded under the rubric of the “organizational synthesis,” a school that emphasizes, following Max Weber, the emergence of a bureaucratic order in business and government as the central paradigm in understanding modern American society and politics. The rise of the vertically integrated corporation at the turn of the 20th century, and the modern regulatory state in response, can at times seem to be an inexorable process, as in the work of the business historian Alfred Chandler, or as the nefarious project of a power elite, in Martin Sklar’s New Left account. Although in agreement with this school on Weberian fundamentals, Wiebe compellingly humanizes the impulse towards bureaucracy while calling into question the omnicompetence of its proponents. The Search for Order dispenses with easy heroes and villains, giving ambivalent consideration to all the important players in the politics of the era. If one tends to easily sympathize with the Populists, as I along with many of my undergraduate students have done, Wiebe balances the genuine fears and concerns of local communities in the face of economic upheaval during the 1880s with a incisive critique of their magic-bullet solutions and utopian panaceas, which oversimplified the complex economic realities in play. The “new middle class” of educated professionals who carried the standard of Progressivism after 1900 combined dynamic reform energy, an ethic of service, and a scientific temper – all hallmarks of modern liberalism. Yet their zeal for rational solutions, he argues, could easily slip from the goal of democracy or economic justice into mere boosterism, social control, or scientific racism. Even Teddy Roosevelt, who gets some of Wiebe’s best verbal rough music, had his purposes: “A man of unlovely traits who relished killing human beings, nursed harsh personal prejudices, and juggled facts to enhance his fame, Roosevelt was at the same time an extraordinarily vital person whose effervescence and extrovertive political style appeared to catch the spirit of a nation – at least of that nation to which a great many citizens wanted to belong.” For better or worse, TR first saw the potential in charismatic executive power for implementing, if erratically, the Progressive agenda. Besides his lively sense of narrative, Wiebe separates himself from the functional and structural chill of many organizational histories in his appreciation for the importance of ideas and values, however flawed or provisional, in motivating historical actors. His chapter on the emergence of social theory in early 20th-century American thought explains with impressive clarity the shift from local judgments of character and status to an increasingly rationalized and efficient vision of the individual in society. Again, depending on the reader’s temperament and experience, you might see this change as liberating the self from the narrow confines of community life, or as a loss of cohesion and meaning within an impersonal, or even repressive, system. Wiebe’s analysis discourages neither perspective, and in fact shows similar reactions at the time, connecting our own present attitudes to their origins in the past. If the book eludes easy political categorization – neither liberal nor radical, triumphal nor declensive – Wiebe nevertheless makes crucial distinctions that show him to be a committed democrat in the Deweyan sense. In his telling, if the most significant development of the period was the emergence of bureaucracy, it was not as a structural reality, a brick-and-mortar ordering of production and distribution; but rather as a mentality, an orientation towards scientific method and rational efficiency. The potential danger in this mentality, however, is that method can be fetishized at the expense of articulating goals and values. Is the goal of efficient management to improve the welfare of the many “according to the wishes of the people involved” or to engineer society to get “the most for your money”? Does the new order serve to control and channel social forces or to release the creative energies of its individual members? Today, the caricature of the bloodless policy wonk or the procedural vacuity of cubical life is endlessly ripe for comedy, and perhaps this reflects one kind of necessary aesthetic adjustment to a system that has only further settled into a complacent middle age since its emergence in the Progressive Era. Wiebe’s tone is more plaintive than this, however, reflecting what I read to be a wounded yet resilient idealism – the strains of 1967 perhaps. His narrative registers the periodic outbursts of nativist and racist violence in American history as well as the impulse towards repression and top-down control. He concludes that the promise of Progressivism never achieved fulfillment partly from hubris and murky thinking, partly out of too much faith in method and too little in pluralist debate. If anything, The Search for Order cautions us to understand our own limitations in trying to know our world in order to control it, no less relevant in an era of seemingly limitless available knowledge. Yet instead of merely a counsel of despair, Wiebe also offers a wealth of nuance in depicting an interdependent nation emerging, “tough and plural,” at the turn of the century. Rather than strive to achieve a “precise, predictable stability,” as he criticizes the bureaucratic ethos, his narrative asks us “to welcome and work with an open universe.” For me, this resonates pedagogically, suggesting an open approach to understanding history and ideas. In working with students who seek definitive answers or confirmations of beliefs they already hold, the challenge then becomes to limber up questions that will allow them to see and to work with an open universe. As a result, the search for order, both collectively and individually, can remain continually present, a flexible acknowledgment of shared limitations. What an excellent essay! Really enjoyed reading it. 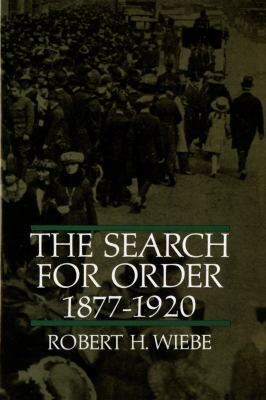 Today’s Sunday “Blog” from the past is written by Judwebre from Tropics of Meta on Robert H. Wiebe’s seminal work The Search for Order: 1877-1920. Like Judwebre, I also read The Search for Order while preparing for comprehensive exams. I’m glad that I did. It is still the place start when studying the Gilded Age/Progressive Era and quite possibly the best book covering this time period.